Former BBC Radio 2 Website Of The Day Broadband Internet UK has today launched a new mobile broadband comparison service to help make dongle hungry Britons search for laptop broadband easier. The new service comes in response to the increasing number of mobile broadband packages being marketed by the UK's mobile phone operators and retailers - A fact backed up by a recent research report from Ofcom* that found demand for mobile broadband rocketing with sales of dongles that plug into laptops and connect to the Internet almost doubling from 69,000 to 133,000 a month between February and June 2008. Visitors to the site's new mobile broadband service can search for a range of mobile broadband types including pay monthly, pay as you go mobile broadband, free laptops with mobile broadband and business mobile broadband. Users are able to compare the packages available for their chosen mobile broadband type using criteria like speed, monthly download limit, contract period, set up cost, monthly cost or first year cost. There's also access to full reviews on each mobile broadband provider, plus featured deals and package ratings. "With the Ofcom findings providing evidence that the UK's mobile operators are beginning to compete with fixed-line ISP businesses for broadband customers, we're going to witness another broadband battleground this Autumn. There's going to be further heavy-weight marketing campaigns promoting a range of cut price home broadband and mobile broadband deals which is likely to make it difficult for broadband buyers to compare supplier with supplier - despite its good news." Steve continues,"Our re-developed site, Broadband Internet UK, enables users to now compare both home broadband and mobile broadband packages all in one place, making it easier for Brits to find the right broadband type and package that best suits their requirements. Users can also keep up to date with all the latest home and mobile broadband deals by using our broadband blog and signing up to our RSS feed or email updates." 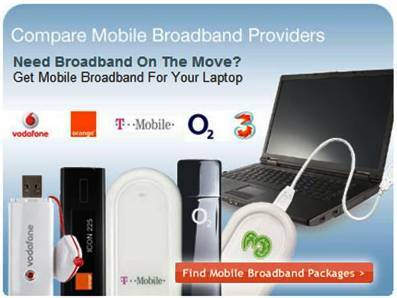 Broadband Internet UK is one of the UK's leading independent guides to home broadband and mobile broadband. The site specialises in offering the UK consumer free online self-help guides & reviews, together with search & comparison tools that aid people's decision making when choosing either a fixed-line home broadband package or a mobile broadband package from one of the UK's mobile phone operators. It is part of Web Offer Marketing Ltd; an independent, privately owned company based in Hampshire. This press release was distributed by ResponseSource Press Release Wire on behalf of Web Offer Marketing Limited in the following categories: Men's Interest, Leisure & Hobbies, Home & Garden, Consumer Technology, Personal Finance, Travel, Media & Marketing, Computing & Telecoms, for more information visit https://pressreleasewire.responsesource.com/about.